The power of partnership. A system of support. Coaching offers more than you think it might. Download your free guide to learn how. The thing about running your own business or being a senior leader in an organization is that though you can be surrounded by people, you can feel like you’re alone in a crowded room. You’re concerned about doing things right and doing the right things. You need an ally. An objective partner to help you evaluate your options when you feel like you’re at a strategic crossroads. That’s where coaching can help. In my work, I help people go from What’s Now to What’s Possible through transformational coaching. My clients are excited and confident about the way forward because of the work they do with me. Together, we’ll build a coaching plan to help you make and meet goals that resonate for every stage of your life’s work. You’ll have an objective advisor at your side who not only understands you but the landscapes that are important to you. We use what makes us unique to help you lead with what makes you unique. From Now to What’s Possible. Working with a coach means you’ve chosen to make an investment in you and your business. Sure, there’s an investment of money and time – but also your accountability. You have goals and you’re hungry for results. 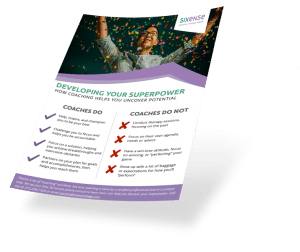 At Sixense, my role is to help you get there with effective change, getting those measurable and sustainable results that you seek when you work with a coach. One of the tools I really love to use with my coaching clients is The Energy Leadership™ Index (ELI) assessment which is a proprietary, research-backed assessment tool that takes something abstract, like the way a person views the world, and turns it into something tangible—a metric that you can see and feel and even reevaluate in the future. And, it’s only available through an iPEC Certified Professional Coach and ELI Master Practitioner like me. You’re probably familiar with personality tests like Myers Briggs and DiSC. These valuable tools can help you understand your strengths, embrace your weaknesses, and discover how you can work to your full potential. In that way, they typically support a “work with what you have” approach to adapting your behavior and pursuing personal excellence. The ELI, on the other hand, is an attitudinal assessment tool that captures how an individual currently perceives and approaches work and life. With the awareness and insights gained through the Energy Leadership Index debrief, clients have the opportunity to reshape their attitudes and worldview and “transform who they are.” What a tremendous way to step into your power and grow as a leader! Whatever your position, I’ve got you covered. Let’s explore how a coach can change your game. Get insights and action to help your business grow with my occasional newsletter.